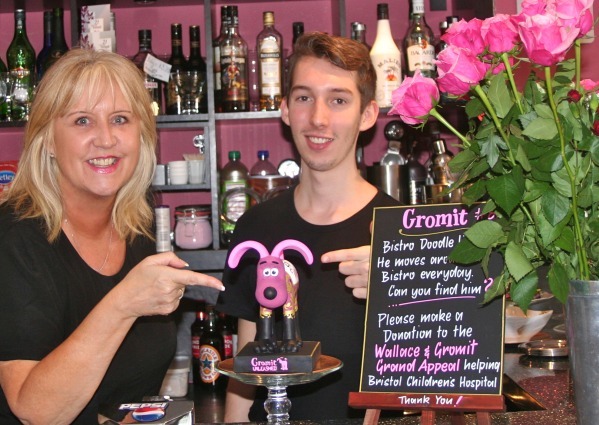 A bistro in Backwell has demonstrated its commitment to charitable causes by selecting Wallace & Gromit’s Grand Appeal as its nominated charity. 21 West Café Bistro will be supporting the charity to help raise funds for the Bristol Royal Hospital for Children and St Michael’s Neonatal Intensive Care Unit. The Bristol Royal Hospital for Children is a world-class centre of excellence – one of only seven children’s hospitals in the UK equipped and able to offer specialist treatment and lifesaving care to over 100,000 sick and critically ill babies and children every year. Wallace & Gromit’s Grand Appeal was established in 1995 and has since raised over £21 million helping to provide life-saving medical equipment, family accommodation, a programme of arts, music, education and play facilities. 21 West Café Bistro Managers Jayne Grocock and Caroline Sutherland are getting behind the appeal by unveiling their own Bistro Doodles Gromit Sculpture for fundraising purposes, as well as regular charity events and a new Grand Appeal charity cake. Jayne said: “We have been fortunate enough to have the community support us since opening our premises in 2011 and now we want to give something back. “Every penny we help to raise for the Grand Appeal will mean a brighter future for sick children at Bristol Children’s Hospital as the funds are used towards comforts, facilities and state of the art equipment. The Grand Appeal is entirely independent from the NHS and receives no statutory funding, relying entirely on the generous support of the local community, businesses, grant-making trusts and other philanthropic organisations and individuals. Helen Haskell, Corporate Fundraiser for Wallace and Gromit’s Grand Appeal, said: “We are thrilled that 21 West Café Bistro has chosen to support The Grand Appeal. For more information on upcoming fundraising events visit the website www.21-west.co.uk or call 01275 463744.